Dr. Zbigniew Brzeziński passed away on May 26th, 2017. This interview you are about to read (or re-read) I had the privilege of conducting with him a long time ago, in 2003, while working at the Polish Weekly. I was a very young college graduate back then. Perhaps somewhat naively, but I wanted to make the interview somewhat lighthearted, given that it was meant for the Christmas issue of our publication. The world was very different then, still coming to terms with the practical challenges of the post 9/11 reality. The Second War in Iraq was several months fresh and the U.S. Presidential election of 2004 was right around the corner, with the campaign which brought about the first speculations about the possibility of Hillary Clinton running in the future for the highest office. For Poland, 2003 was very eventful too, as the country was preparing for the historic entry to the EU, following the “Yes” referendum conducted in June of that year. The country was still a fairly fresh NATO member after the accession in 1999, and President Aleksander Kwaśniewski had the last two years left in office before the 2005 election. His high popularity raised hopes among some, that perhaps his wife, Jolanta, would run for office. Having an opportunity to get some personal reflections from Dr. Brzeziński on those and a few other topics was a privilege I knew I needed to cherish. In fact, I was sure that he agreed to it for two reasons alone: my young age at that time and my previous interview with his dear friend, Jan Nowak Jeziorański, the founder of Radio Free Europe. During the talk, he proved to be a warm and personable man, very much encouraging inquiries and being appreciative of the Polish-American roots, which gave him so much. Although this interview remains to be the one conducted by a very young and still gaining experience graduate of the Communications Arts program, it seems appropriate to bring it back out into the light in the wake of the passing of Dr. Brzezinski, as the testimony of his strength of intellect, deeply rooted sense of identity and personal magnanimity. May he rest in peace. National Security Adviser to President Jimmy Carter (1977-1981), counselor for Center for Strategic and International Studies, professor of American Foreign Policy at the School of Advanced International Studies at John Hopkins University in Washington D.C., Dr. Zbigniew Brzeziński was one of the most influential Polish-Americans of the twentieth century. (President Jimmy Carter’s remarks at the swearing-in ceremony for Cabinet members, January 23, 1977). Ksawery (Xavier) Swiecki: Was there a person who had the greatest influence on the way your life has shaped? Dr. Zbigniew Brzeziński: I can’t name a single person, but obviously, in the first instance, my father, because he was deeply involved in international affairs and I grew up at the time when international affairs impacted, perhaps more than before, on what was happening literally to hundreds of millions of people around the world, including my own family. Hence there was a kind of symbiosis between his involvement in foreign affairs and what was happening to all of us. KS: Was there a particular event, or set of events, which you would consider being a turning point in your life? ZB: Obviously one turning point was the loss of Poland’s independence, not in 1939 but in 1945, when it became clear that World War II which started with the Nazi attack on Poland would not mean the recovery of a Polish state but a prolonged period of subordination to the Soviet Union. That in effect meant that the first phase of my life, which was Poland-oriented was now being redefined in the permanent identification with North America; first in Canada and then in the United States. So, I would say, that was the first major turning point. The second major turning point was going to Harvard, which, all of a sudden, opened up enormous vistas of opportunity and challenge to me. I suppose the third major turning point was in 1960s, when I became involved with the Kennedy campaign, but also moved to New York from Harvard. For the first time I began to see myself as potentially a more significant player on the American political scene. KS: To what extent do you keep your ties with Poland; how often do you visit; do you have the dual citizenship? commitment by reasserting my original, Polish citizenship. None of that, of course, negates either my deep, cultural, historical roots in Poland, nor my continued affinity for Poland. KS: “Poland is a beautiful and heart-wrenching, soul-split country which in many ways… resembles or conjures up images of the American South – or at least the South of not-so-distant times…” –What are some of the qualities that Poles and Americans share today and what do you see as differences between them? ZB: I would say that the most important one that Poles and Americans share in common is individualism and attachment to personal freedom. The important differences are that Americans know how to work in a system collectively and they know how to translate individual initiative into a systemic, collective achievement. Poles find that very difficult to do. That is why America is such a success and that is why Poland continues to have serious difficulties. ZB: I think my key to success was, first of all, luck; and I would put a lot of emphasis on that. Being in Harvard opened up, as I said earlier, enormous opportunities for me. Then, simply by becoming involved in the Kennedy campaign and the great deal of publicity that was given to me, that generated for me, at the relatively early stage of my career, luck. And then the fact that I decided to support Governor Carter from Georgia for his run for the presidency at a time when no one generally took him seriously–also, in some respect, luck. KS: You wrote about President Carter in your book: “I learned that he in fact had several smiles…Carter had a few pet sayings which I also came to interpret more accurately once I got to know him better…At times Carter could also be extremely pedantic …I never doubted that I was dealing with a shrewd, rather deliberate yet fundamentally very decent and engaging person who combined high intelligence with occasionally surprising naiveté, genuine dedication to principle with sometimes excessive tactical flexibility.” What quality of Jimmy Carter as a person do you consider to be his best? ZB: I think his decency–fundamentally good, Christian ethic. Secondly, his high intelligence; a very intelligent person who can assimilate a great deal of information, digest it, remember it and use it. KS: You’ve referred to G.W. Bush’s view of the world as “paranoid,” during a conference (sponsored by American Prospect, on Oct. 28, 2003). Where is America heading under the leadership of G.W. Bush? ZB: Towards increasing global isolation and lack of credibility. That is the sad fact, that that is simply a statement of reality supported by all sorts of measures, particularly international polling. The fact is that America is mistrusted and American foreign policy is increasingly viewed around the world as, in some respect, destructive. In a recent public opinion poll undertaken in countries that are allies of the United States, America was listed as the second country most dangerous to global peace. Those are serious concerns. Obviously, these reactions are exaggerated and in many respects unfair, but they are, unfortunately, also connected to what has been happening to the world scene the last two years. KS: What are some of your thoughts with respect to the Polish involvement in the war in Iraq, particularly on the presence of Polish troops there? ZB: I think Polish troops in Iraq involve a very conscious and justified decision by Poland to support the United States, when the United States is isolated. The result is to strengthen the strategic, American-Polish connection and that is in Poland’s interest, especially since Poland is already a member of NATO but not yet of the European Union. KS: Very soon, however, Poland will become officially a member of the European Union. Why is it good or why is it bad for Poland? ZB: I think it is good and there are at least two reasons for it at least. First, being in the European Union means that Poland doubles its security. Its security is, first of all, guaranteed by Poland’s membership in NATO and through NATO by Poland’s strategic relationship with the United States. But you cannot be sure that the United States will remain in Europe indefinitely. However, if in the meantime, Poland becomes an integral part of Europe then any threat to Poland becomes, simultaneously, a threat to the rest of Europe. So, Poland’s security is maximized. Second reason is that by being in Europe the internal management of Poland will be indirectly influenced by people who are better managers than Poles, have a better sense of systemic, collective collaboration, have a more developed political culture and have higher standards of administrative probity, administrative honesty. The fact is that Polish administration is extremely inefficient, the Polish legal system almost a caricature and the Polish system is increasingly permeated by corruption. Being within Europe will generate pressures, effective pressures, to start dealing seriously with these problems. KS: Do you see Mrs. Jolanta Kwasniewska, as the future President of Poland and Hillary Clinton the future President of the United States? ZB: You ask me to make a prophecy? KS: More about the chances that these two ladies have, if at all, in their eventual pursuit for the highest office? ZB: Public opinion polls indicate that both of them have a chance. But that does not prejudge the question whether both, or either one of them, should necessarily be president. KS: Do you find them qualified? ZB: I think that is to be demonstrated by both of them in the course of their public careers. We have a number of years for that to be tested. KS: What does Professor Brzezinski like to do in his spare time, if you have spare time? ZB: I have a group of friends in Washington with whom I have played tennis regularly for a long time. I play singles regularly because that gives me much more exercise and challenge. I do have a cluster of friends with whom I do that. KS: What is your New Year’s wish for Poland and for the United States? ZB: My New Year’s wish for Poland is that Poland continues to transform itself into a genuinely advanced, modern society that has deeply embedded political culture and that is an example of constructive and decent values, that is inhabited by a patriotic and dedicated Polish community that is simultaneously an integral part of Europe and a close friend of America. For America, my wish is that we adopt a broader vision of our role in the world, avoiding an obsessive and narrow preoccupation with one problem, namely terrorism, and prove ourselves able to transform our power, which is unprecedented in scale, into truly effective and accepted global leadership. If we don’t do that then I am afraid that our present supremacy could become increasingly challenged and our security could be increasingly endangered. KS: Dr. Brzeziński, I thank you very much for your time. ZB: Not at all. I was delighted to do it. 1. William Styron, Sophie’s Choice, quoted in Zbigniew Brzezinski, Power and Principle (New York: Farrar, Straus, Giroux, 1983), 20. 2. 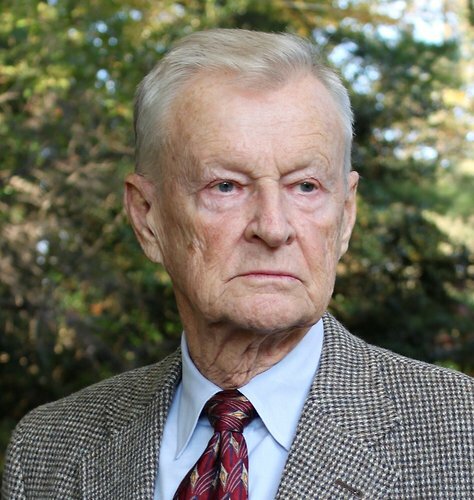 Zbigniew Brzezinski, Power and Principle (New York: Farrar, Straus, Giroux, 1983): 21, 22.